After I finally wrote my chicken and dumplings recipe, I went around reading a couple other recipes to see what they had in theirs. You never know what will spark inspiration for your next recipe. As I was searching, I came across a couple recipes that were called “Old Fashioned.” What does that mean? 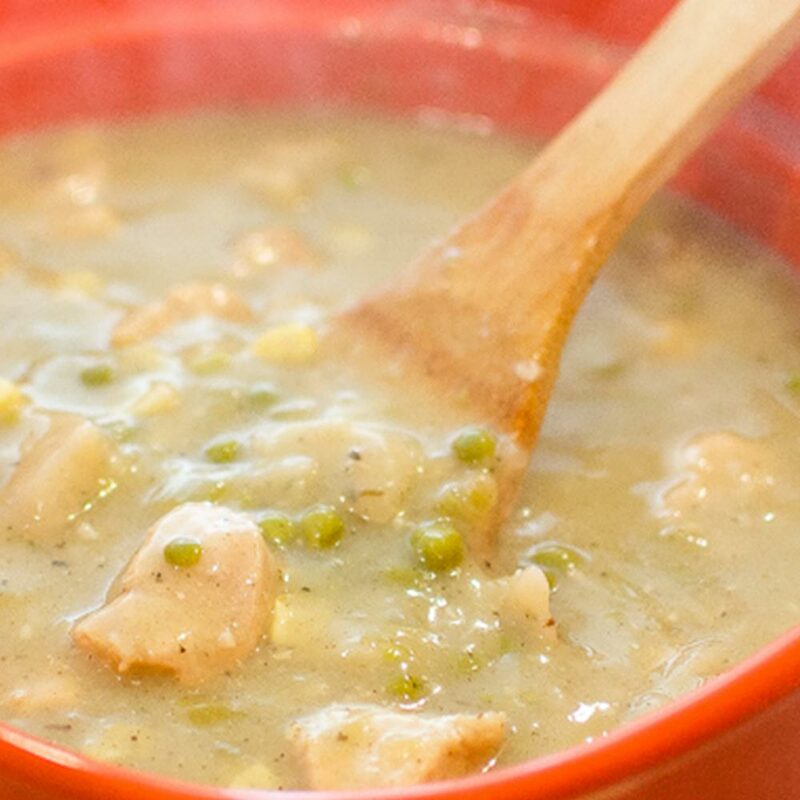 Does a certain type of chicken and dumplings go out of fashion? I wonder what my dumplings must feel like with all that pressure to stay up-to-date and not become a passing fad. Are they the leisure suit of the dumpling world, or that little black dress that never goes out of style? The first thing I do is chop all my veggies and chicken. I toss a couple of tablespoons of butter in the stock pot and cook the veggies until translucent. Then, I add in the chicken to the veggies and cook it until it’s no longer pink. The chicken only takes about ten minutes if it’s cut into small pieces. Once that’s done, I add the flour which is what thickens the sauce. After about a minute to cook, it’s time to slowly add in the chicken broth and add in the seasoning and frozen veggies. While I’m waiting for the chicken and broth to come to a boil I get to work on my dumpling dough. It’s pretty straightforward. Mix everything together. Roll it out. Cut it. I use a pizza cutter to cut the dough, but half the time I forget, so a non-serrated knife will work too. Once you have them cut to your liking, toss them in and cover. I like to turn the heat down a little once I put the lid on. It usually takes about 15-20 minutes for my dumplings to cook. The thicker they are, the longer they will need, so adjust your time accordingly. It’s okay to taste test. I won’t tell. This was gone in less than 10 minutes once I put it on the table. I am glad I “taste-tested” it. The kids ate the chicken and dumplings like I forgot to feed them lunch, which I didn’t. Bite-size chicken, swimming in a robust southern homestyle sauce with vegetables and homemade dumplings. Clean and cut the chicken into small, bite-size pieces. Set aside. Clean and chop the celery, onion, and garlic. In a large stock pot, melt 4 tbsp of butter on medium heat. Toss in the celery, onion, and garlic. Cook until softened and translucent. Add the chicken to the stock pot and continue cooking until the chicken is almost completely cooked (five minutes). Turn the heat up a little in order to bring the contents of the pot to a low boil, and add in the poultry seasoning, salt, pepper, and bay leaf. Allow boiling for 15 minutes. While boiling, begin making the dumplings: in a large mixing bowl add 1.5 cups flour, 3 tbsp butter, 1.5 tsp baking powder, 1 tsp parsley, 1/2 tsp salt. Mix the dumpling ingredients, making sure to break up the butter. I squish the butter between my fingers in the flour until it’s all the size of peas. Slowly add the milk, while mixing. Be sure not to over mix. Turn the dough onto a floured, flat surface. Cover with enough flour as to not be sticky, and roll the dough out to 1/4 thickness using a rolling pin. Using a pizza or pastry cutter, cut the dough into bite-size rectangles. (Be careful not to ruin your counter if you’re like me and don’t use a cutting board for this step). Gently add the dough pieces to the chicken, and allow to boil covered for another 15 minutes. Once the dumplings are cooked, remove the bay leaf and serve warm. Follow along with the companion video as I make this recipe.